Central Grill is one of those places that has the ambiance I get from most of the Turkish places I’ve been in recent history: a modestly-classy restaurant geared around both eat-in and take-away service, featuring a large service area with a spinning spit of meat, several attractive refrigerator cases of to-be-cooked kebab, and a nice, well-lit and clean dining area. The staff promptly seated me at a nice window seat and offered up a beverage while I perused the menu. 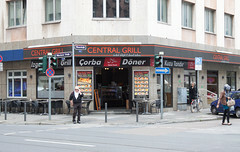 Central Grill has a pretty good selection of Turkish food, with a decent collection of soups, kebabs, and various Döner dishes carved right off the spit. After looking over the options, I opted for the Adana kebabı, a pleasantly spicy ground meat mixture served up on a skewer. Done well, this is one of my favorite styles of kebab (I like the similar Iranian koobideh kebab as well, when I can get them), and Central Grill does a good job with theirs. A nice, flavorful meat with bold chile pepper notes. A nice char on the kebabı. A flavorful rice/barley medley below for both taste and texture. A nice spicy sauce. A few grilled chile peppers to round it out. The result was a very bold and flavorful dish that was a nice difference from the German food of the last several days. Best of all, Central Grill is rather cheap, at least at lunch. 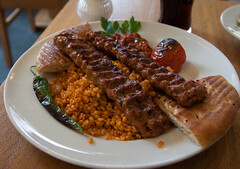 I had my complete fill of delicious spiced kebab, served up by a friendly and attentive staff, for under 10 euro. I only wish I could get something this good around home.